1. 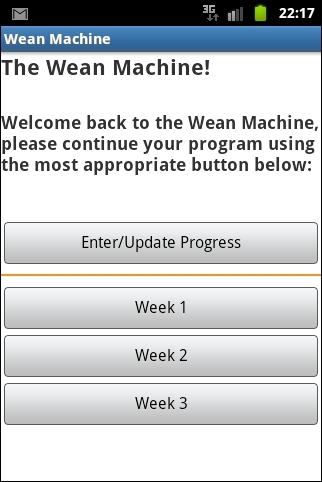 After downloading the app, the Wean Machine logo appears in the list of installed applications. 2. If this is the first time the app is used, then this screen is displayed. 3. 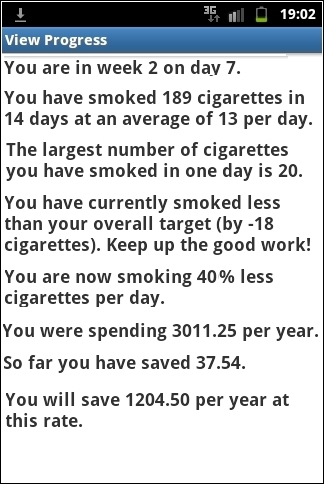 If this is not the first time, then you get a welcome back message and depending upon how many weeks data you have entered it will provide a button for each week if you wanted to view the history and a button to enter your progress for the current week. Home – returns user to front screen. Options – clears all stored data and start again. 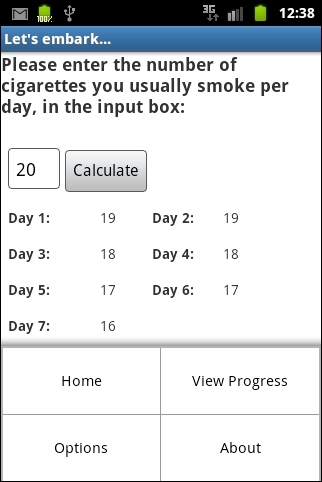 View Progress – provides results to date. About – provides additional info and website links. 7. 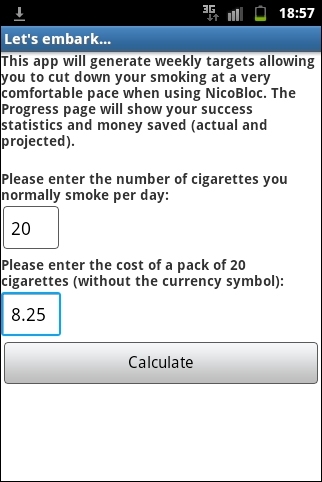 View Progress – this gives a snapshot of what day you are on with a summary of number of cigarettes smoked per day and current average and how much money saved. 8. 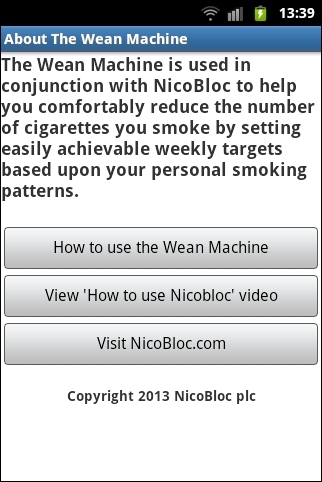 About – this page provides links to an explanation on how to use the NicoBloc Wean Machine, a 'How to Use NicoBloc' video and to NicoBloc.com. 9. 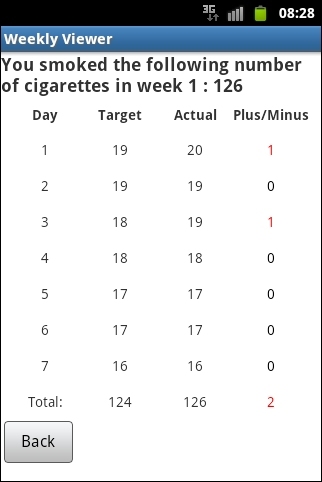 Data entry – key in Week number (default is current week) and the number of cigarettes smoked per day. 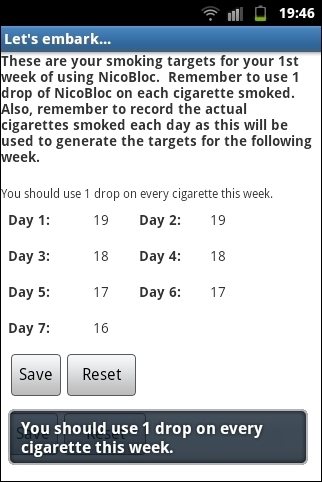 You can save each day as you go using the app as a daily record. Either press Next or scroll down to the Save button. 10. 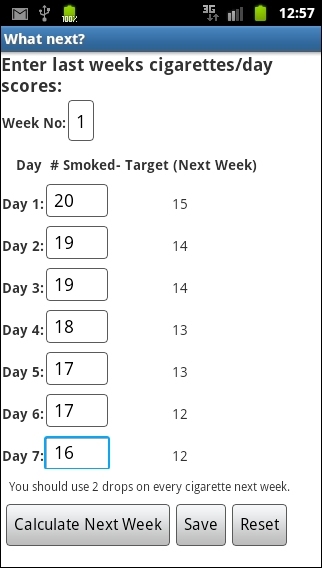 After entering all of weeks smoking data, pressing ‘Calculate Next Week’ will generate next week’s targets and remind the user as to how many drops to use on each cigarette in the following week. 11. 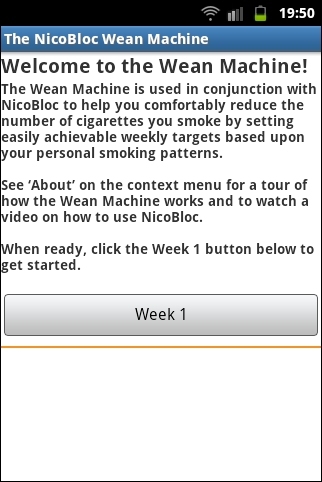 Weeks 2 onwards – from the welcome screen, select Enter/Update Progress and repeat from step 9. 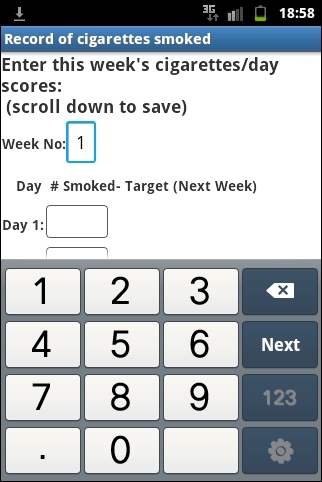 Clicking on the Week number will show your results compared to your target for the week.